Acadian Texas Paramedic of the Year Alec D’Storm is always professional and comes to work ready to shine. As a role model who strives for excellence, he holds other employees to a higher standard, and that makes them strive for excellence, too. Alec showed his aptitude and commitment to his career early on. He graduated in the top of his class and has received a Meritorious Service Award. 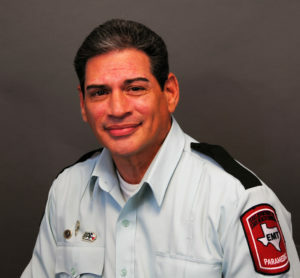 Based in Bexar County, Alec has been with Acadian since 2014, and he has become one of the most well-known medics in our area. He has a background in management and puts that knowledge and experience to work in his role at Acadian. Or should we say many roles: He is a preceptor for EMTs and Paramedics, a Safe Baby Program trainer and co-coordinator, and a PALS, ACLS, and CPR instructor. Alec has volunteered for many different projects, including being the face of EMS at career days at area schools and Shattered Dreams programs. He has been loaned to Acadian’s Safety Management Systems as a medic for an onsite clinic, helped to make training videos, and assists with Baptist mobile health events. And even with this lengthy list, he’s always looking for ways to contribute more. Alec started helping with our local Explorer program recently, and he assisted with our latest acquisition, too.